Our Sacred Healing Salve for Skin contains a sacred secret combination of natural ingredients that were activated, in our ancient lineage’s traditional manner of 7 ancient Love Energized Ceremonies, using Teraphim Unity Consciousness level Healing Energies of Unconditional Love for maximum healing power. In the ancient healing way of Love Energized Adept Alchemists, the energies from Philosopher’s Stones and ancient sacred sounds infuse Teraphim Unity Consciousness level Healing Energies of Unconditional Love directly into natural ingredients to create the Sacred Beeswax, sacred medicinal plants and sacred medicinal oils of Sacred Healing Salve for Skin. 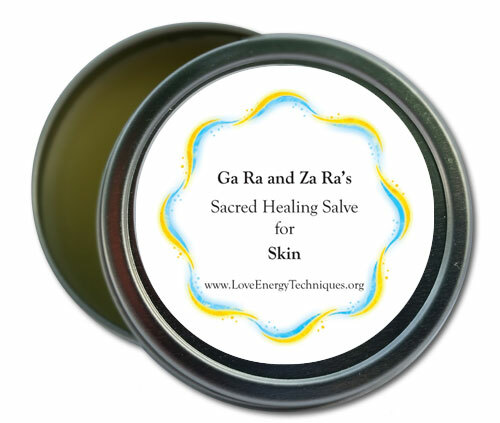 People suffering from skin rashes, sores, cuts, abrasions and insect bites have found healing help and relief from pain by applying Ga Ra and Za Ra’s Sacred Healing Salve for Skin over the area of their skin problem.